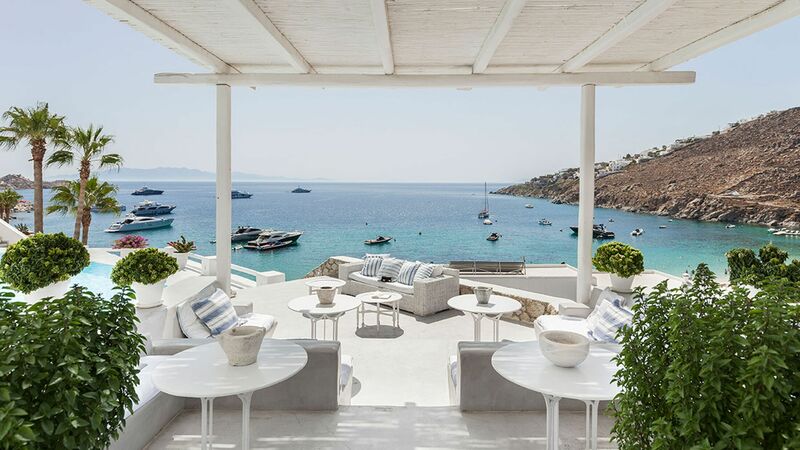 Only 5km from the capital, Grecotel Mykonos Blu offers a calming respite from, yet easy access to, the hectic nightlife and vibrant daytime activities to be found in Mykonos Town. Lording it over one of the most famous and fun beaches in the world, with clear, turquoise sea, golden sand and various water sports, the hotel boasts direct access to its own private beach area, with first class facilities and services. However, if its relaxation you’re looking for, don’t rush off because this opulent hotel also features restaurants and bars, numerous private pools, a large infinity pool, fitness room, sauna and spa – plenty here to sooth body and mind. A piece of paradise for honeymooners or couples looking for a blend of tranquillity and action, or perhaps a luxury stopover for island hoppers – for certain nobody will want to leave. In the Eastern Mediterranean, the beautiful, cosmopolitan Greek island of Mykonos is graced by its fair share of celebrities and those who know how to holiday. The island’s natural beauty offsets typical white washed towns adorned with colourful flowers and paintwork, and mixed with rich history and architecture. The hotel has 103 suites, bungalows and villas. Boasting panoramic sea views, this brasserie serves fresh, traditional Greek dishes and seafood, with a nod to Italian and French cuisine. The dress code for daytime is casual, although guests are required to cover bathing suits for breakfast and lunch. In the evening no beachwear or shorts are allowed. Men are required to wear long trousers and shirts with sleeves. Al fresco dining overlooking the beach and ocean - this is the perfect spot to enjoy contemporary seafood and Mediterranean fare. Food and drink are available all day, with a complementary drink and snack available in the morning and afternoon. This rooftop cocktail bar provides wonderful sunset views across the pool, gardens and Psarou beach. Footwear is required at all times in Mykonos Blu’s restaurants and bars. Naturally, the hotel’s first class service includes the essentials - sunbeds, comfy mattresses, umbrellas and towels, but it also provides changing and shower facilities, a beach bag with accessories, plus complementary beach drinks and snacks morning and afternoon. The large infinity pool is designed over two levels in harmony with the natural landscape. In addition, there are various private and shared pools throughout the property. The spa offers a suite of treatments for body and soul: massages and therapies target a variety of specific and general body areas and requirements, and a full menu of salon treatments is available. The Elixir range is designed to reflect ancient Greek rituals and provide a unique experience. The Sauna and fitness room is free of charge to all guests. Yoga is available at a charge. A 20% discount available on some treatments with advance bookings. The Mykonos Blu Hotel offers regular chargeable yoga classes. The hotel offers facilities for beach events should you wish to use them. Additionally, there is fun to be had away from our private beach area with various water-sports and water taxis available at a cost. You can catch live music at the hotel’s bars every week – possibly getting you in the mood for a night out on the town. 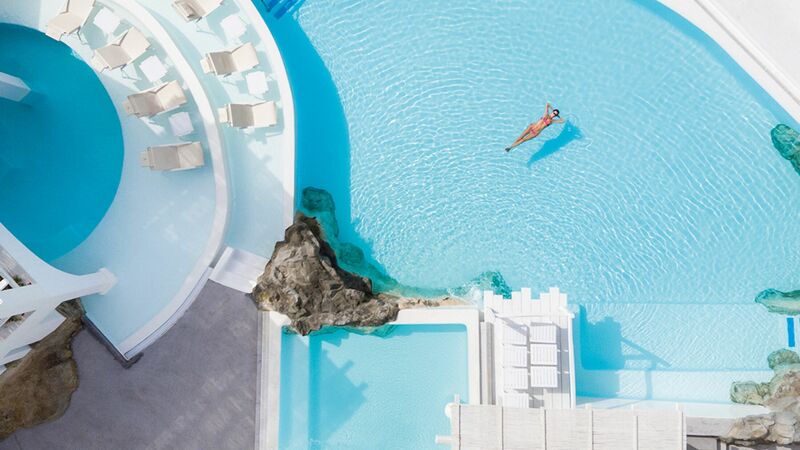 Grecotel Mykonos Blu is located on the south west coast of the Greek island of Mykonos, in the town of Psarou. Here you’ll find exclusive hotels, villas and restaurants dotted throughout, as well as beautiful hillsides which overlook the sparkling Aegean Ocean below. Spend days simply relaxing on the golden sandy beach, ordering drinks, snacks and refreshments right from your lounger. Trendy restaurants and bars are dotted throughout the resort and provide some of the island’s best cuisine. And if you’re looking for a lively atmosphere and a selection of art galleries, boutiques and designer shops, Mykonos Town is just a 10 minute drive away. 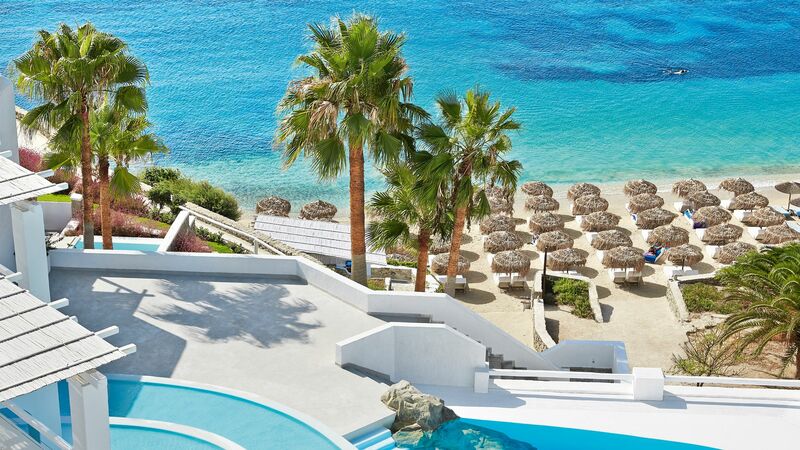 Grecotel Mykonos Blu is a 15 minute drive from Mykonos Airport. Island Garden Rooms measure approximately 29m² and are located in the hotel gardens, offering views over the hotel grounds. Decorated in traditional Aegean style with crisp whites and striking blues, these rooms feature air conditioning, satellite TV, telephone, complimentary WiFi, minibar, safe, bathrobes, slippers, hairdryer and beach and pool towels. Island Bungalow Side Sea Views measure approximately 29m² offering partial views towards the sea. Decorated in traditional Aegean style with crisp whites and striking blues, these bungalows feature air conditioning, satellite TV, telephone, complimentary WiFi, minibar, safe, bathrobes, slippers, hairdryer and beach and pool towels. Island Bungalow Deluxe have a prime location in the resort with great sea views and a polished stone walk-in shower. Waterfront Bungalow measure approximately 29m² and are located in a prime location, overlooking the Aegean Sea. Decorated in traditional Aegean style with crisp whites and striking blues, these rooms feature air conditioning, satellite TV, telephone, complimentary WiFi, minibar, safe, bathrobes, slippers, hairdryer and beach and pool towels. Island Bungalows with Private Pool measure approximately 35m² and are located within a private garden. They have a seating area and a spacious terrace with a private plunge pool. Honeymoon Bungalows Seafront have a prime location on the waterfront with stunning sea views and a whirlpool on the covered terrace. Luxury Bungalows Private Jacuzzi® measure approximately 35m² and are scattered around the hotel. They offer a large veranda with private whirlpool. Mykonos Blu Apartments measure between 52 - 70m² and consist of split level accommodation with a master bedroom, bathroom and a veranda on the entry level and additional bedroom and bathroom downstairs. In addition to regular facilities, guests staying in the apartments also receive two complimentary à la carte dinners per week in selected restaurants, welcome refreshments upon arrival and more. Mykonos Blu Apartments with a shared pool measure between 52 - 70m² and consist of split level accommodation with a master bedroom, bathroom and a veranda on the entry level and additional bedroom and bathroom downstairs, there is a beautiful private pool shared with another apartment. In addition to regular facilities, guests staying in the apartments also receive two complimentary à la carte dinners per week in selected restaurants, welcome refreshments upon arrival and more. We stayed at this dreamy hotel with our 18 month old daughter and really enjoyed our stay!! Upon arrival we were greeted and invited for a complimentary refreshing drink in the dreamy blue and white lobby area. The lobby was a great place to lounge and soak up the views of the Sea and Psarou beach. The design was minimalistic but the decor including the blue donkeys really gave it an classic contemporary, individual feel. We received a complimentary room upgrade with sea views giving us added space. The bathroom though having a traditional feel could have benefited from extra lighting. The location was great with the hotel boasting it?? ?s on private beach and there are lots of cafes and restaurants a short walk from the hotel. The Kids club was great keeping our toddler entertained. The breakfast was tasty with a variety of options and the pool area was stunning. Definitely a lovely stay within a dreamy setting and would definitely return given the chance. We recently went to Mykonos for our anniversary. As soon as we arrived at the Mykonos Blue hotel, the staff was welcoming and wonderful. The hotel is clean, well kept and beautiful. We had a room with a private pool and it did not disappoint- the views were beautiful. The selection at the breakfast buffet was amazing and fresh- I loved the baked tomatoes with feta and fresh olive bread with olive tapenade. Dinner at the hotel restuarant was excellent as well- the sea bass was perfectly cooked. Across the street there is a great Taverna called Nikos I highly recommend where the lamb and baklava is to die for. For the nights we didnt want to party the front desk gave us movies on a USB key to watch in our room. Everyone was so accommodating and the service was excellent. I can't say enough about this place as it was a dream vacation for us. A big thank you to Anna at the front desk, Vaso at the pool and Elias at the restaurant for truly making our stay extra special. I would definitely book at another Grecotel for when we plan on exploring the rest if Greece. The best place I have ever visited! I can say, that this place is paradise on the earth!! The most wonderful and beautiful places in the world!!! I can highly reccomend this hotel for everybody! Thanks for the high quality and perfect service! This is a beautiful and romantic hotel! It was the perfect destination for our anniversary trip. When we arrived, our room had cold champagne waiting and rose petals on the bed. We had a balcony for evening drinks with a great view of Psarou Bay. The service was exceptional, and the staff was extremely attentive to our needs. We had delicious breakfast at their impressive restaurant, and our room was cleaned twice each day. Additionally, Mykonos Blu is located just a short two minute walk down to the beach, and they provide a complimentary shuttle to and from Mykonos town every hour. We enjoyed the beach each day, and had lunch and drinks served by their staff. Mykonos Blu provided us a relaxing and truly exotic vacation. 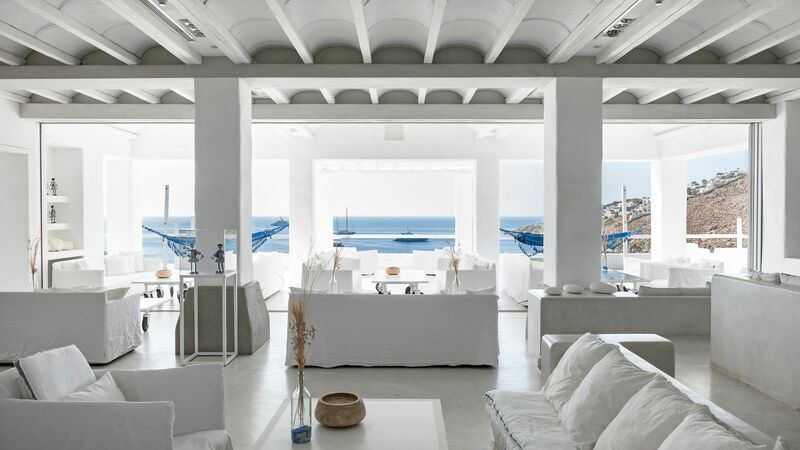 If you are looking for a boutique hotel that caters to you, Mykonos Blu is the place to stay.